The word photography literally means the recording of light, so help your camera out a little by taking five seconds to assess the situation. Perfect lighting isn’t the goal, but being mindful about where the light is coming from will help your photos look better. Is there a strong light behind your subject? Can you reposition them or move your feet and reposition yourself? Keep people’s faces looking into the light or from the side. Diffused sources such as near a window work great, but if you keep people from being backlit, you’re ahead of the game already. Also, the light happening around sunrise and sunset is great for photographing people, buildings, monuments, and vistas. Most smartphones have an overlaid grid on the screen available to help you compose and level your shot. Turn this feature on. If the shot calls for a level horizon, such as a sunset photo, take your time and level it up! A tilted horizon looks off in landscape shots, and if it’s level, it will appear much more pleasing to the eye. Smartphones use a digital zoom, which means they’re just cropping the image in the camera, resulting in comparably grainy and fuzzy images. Keep it zoomed all the way out for optimal results. Did you know your iPhone and most other smartphones support the volume button as a shutter? What this means is, you can use the hard button instead of the one on the screen to take photos, making for a steadier shot in many instances. You can also use this to experiment with one-handed low or high angles, which may make for a unique perspective on an otherwise familiar scene. But please, get a good grip before you dangle your phone over a railing or other dangerous place! Modern smartphones have great macro (close up) capabilities. Get in close, get some good light, and you’ll get great results. Everything from bugs to burgers, macro can make it interesting and fun. Smartphones can take great photos, no doubt, but when conditions aren’t optimal, they lack the speed, flexibility, and quality of a more powerful (and bigger, heavier) DSLR. Get to know your phone. If it does poorly in the dark, avoid that. If you notice really bright scenes getting washed out, wait for it to get darker. The more photos you take, the more you can tell where your camera will shine, and where it will falter. Smartphone flashes are so weak, they’re fairly useless in most situations. Plus, they can result in red eyes and washed-out faces in pictures of people. Also keep in mind that your phone’s camera contains a computer, so if it doesn’t have to calculate whether or not to use the flash, it will perform slightly faster. Your camera’s metering system, just like any other meter, measures something. In this case, it’s the amount of light coming in through the lens. Simple, right? You can select different metering spots on your screen by touching them. Try to strike an optimal balance between light and dark, then snap away. With the ease of sharing photos now, it’s simple to think of only your online audience. But don’t forget, this is your vacation! Take photos you’ll look back on fondly years later: the people you’re with (not just the scenery), funny inside jokes (an unusual sign at the hotel you pass by every day), and candid shots (because the ramrod-straight posed, grinning shots get old quickly and don’t always capture personality). 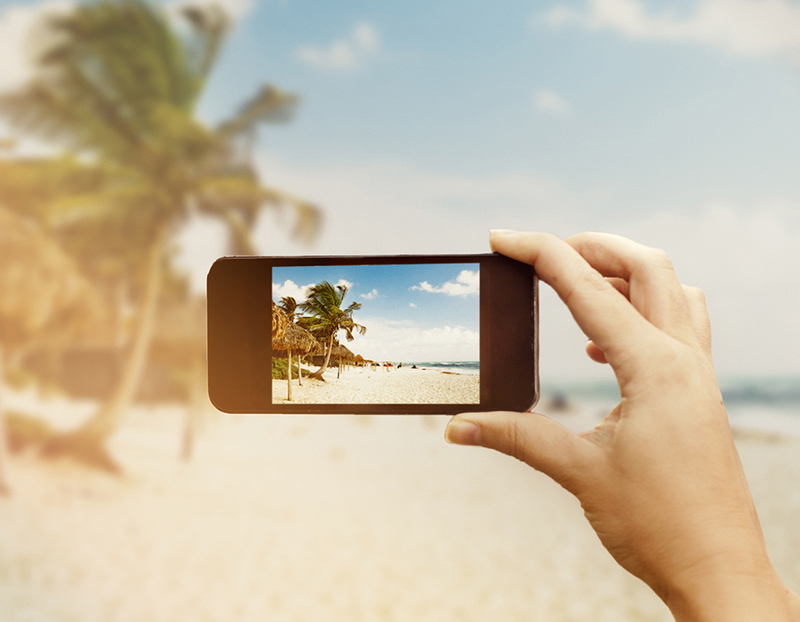 Smartphones are awesome- they’re always in your pocket, take great photos, and are adequate for probably 98 percent of vacation goers. The cameras in them are constantly improving, but they still fall behind the shrinking point and shoot market in ergonomics, speed, photo quality, focusing ability, and low light performance. Invest in a point and shoot or DSLR if you constantly find your smartphone falling short, or if you want more creative control over your vacation photos.